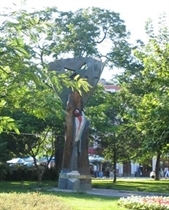 Today, May 26th 2006 (Friday), the Angolan Ambassador, Gen. Felipe Felisberto Monimambu is expected to visit Plovdiv for an official meeting with the Plovdiv mayor, Dr Ivan Chomakov. The General arrives from the Angloan Embassy in Belgrade (it serves for the territory of Bulgaria as well). After the end of the meeting, at 11.30 am, the guest is expected to share his impression of Plovdiv and Bulgaria with journalists at a briefing.